Will chatbots soon replace teachers? Is it possible to experience exams through a virtual reality headset? And do you still need language courses at all in an era of translation software? Academics, teachers and learners, as well as publishing representatives and programmers came together at the STARTKLAR?! 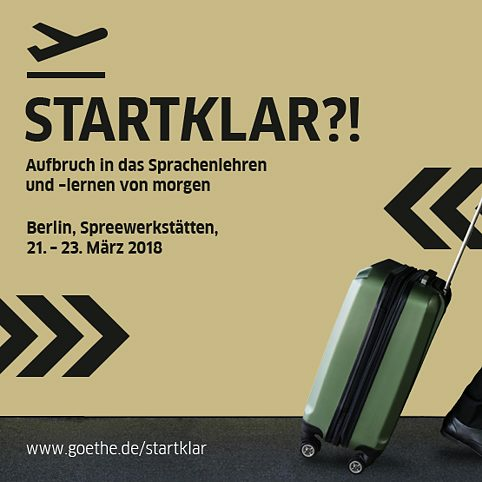 workshop conference from 21st – 23rd March in Berlin, to discuss the future of digital language learning and develop actual approaches. © UHH Jannis Androutsopoulos is Professor of Linguistics specialising in German and media linguistics at the University of Hamburg, as well as Research Professor at the MultiLing Center of Excellence at the University of Oslo from 2016-2021. His research focuses are media linguistics and sociolinguistics, as well as multilingualism research. In his current projects he is investigating the link between multilingualism and digitally-communicated interaction between migrants and refugees, and in this context one of his interests is the processes of informal language learning. Androutsopoulos was a member of the Goethe-Institut Language Advisory Board from 2012-2018. © Doug Belshaw helps people become more productive in their use of technology. Currently working with Moodle, a co-op he help found, and as an international consultant, Doug has expertise in digital literacies and new forms of alternative, digital credentialing. He has worked on Web Literacy and Open Badges for the non-profit Mozilla Foundation, as well as in universities and schools. © Falko Siewert | Mozilla Foundation is currently leading Mozilla's strategic engagement with Global Internet Fora. In this position, she is tasked with identifying emerging trends around privacy and security, digital inclusion and literacy, openness and decentralisation in order to remain aware and ahead of global tech policy developments. She is a political scientist by training and has always had a keen interest on the intersection of technological developments and human rights. © John Stevenson is a Lecturer in Data Science at City, University of London, working on topics at the intersection between artificial intelligence, computational creativity, and cognitive systems. After studying mathematics, computer science, and logic, he obtained a PhD in cognitive science. Among others, he was/is the General Chair of the HLAI Joint Multi-Conference on Human-Level Artificial Intelligence in 2016 and 2018, and founder and/or organizer of several international workshop series at the intersection between AI and cognitive science. © Anika Bethan After her Master’s Degree in Modern German Philology and Modern History at the TU Berlin, Dr. Phil Anika Bethan started a PhD in European memory history at the FU Berlin, which she successfully completed in 2010. After that she worked as a teacher of German as a Foreign Language. From 2011 to 2015 she relocated to the universities of Fez (Morocco) and Cairo (Egypt) as a DAAD “Lektor” and GFL lecturer. She has worked at the EF International Language School in Berlin as Academic Director since 2015. © Donald Clark is an EdTech Entrepreneur, CEO, Professor, Researcher, Blogger and Speaker. Describing himself as ‘free from the tyranny of employment’, he is a board member of Cogbooks, LearningPool and Vice-Chair of Brighton Dome & Arts Festival. He is also a Visiting Professor, Fellow of the Royal Society of Arts (FRSA) and involved in research into AI in learning. He has worked in schools, vocational, higher, corporate and adult learning, delivering real projects to real learners. © Astrid Eckert, TU München is Professor of Linguistics in German as a Foreign Language at the Herder-Institut, part of the University of Leipzig. After his doctorate at the University of Munich, he worked at a lecturer in various countries including Mexico and at King’s College London, before taking up his current position in Leipzig in 2006. His specialisms are grammar and language teaching, scientific communication, corpus linguistics and text linguistics. He is head of the binational Master’s Degree courses, with universities in Cairo and Hanoi. Christian Fandrych is Chair of the Language Advisory Board at the Goethe-Institut. © Hermann Funk Professor of Education and Teaching Methodology for German as a Foreign and Second Language, Friedrich Schiller University Jena, Department of German as a Foreign Language and Intercultural Studies, areas of focus: general education and teaching methodology in foreign languages, research and development of teaching content, business German, Chairman of the Scientific Advisory Board of the Central Agency for German Schools Abroad and Director of the Department for Textbook Research and Material Development. © DFKI has been one of the scientific directors at the German Research Centre for Artificial Intelligence (DFKI) since 2014, where he heads the Multilingual Technology Group, as well as Professor of Translation-oriented Language Technology at Saarland University. He worked in Ireland at Dublin City University (DCU) from 1996 – 2014 and was Director of the Centre for Next Generation Localisation (CNGL, now ADAPT) and Director of the National Center for Language Technology (NCLT). © Commons Wikimedia is a discussion shaper and teaching media specialist. Analysing digital network architectures and the question of how they enhance and change environments has been the focus of her thoughts and actions for more than 15 years. As didactic coordinator at mediale pfade, she has been involved in the www.edulabs.de project since April, in which she helps to promote out-of-the-box ideas as open education resources for a modern media education. Before that, Christine Kolbe tested cross-media projects for German teaching and developed material for various aspects of media education (privacy rights, free content on the internet, mobile learning and VR technologies). With her expertise in the formats and methods of digital and analogue environments, the discussion shaper actively advised and influenced in a process support capacity, alongside her media education involvement in numerous civil initiatives. She likes Berlin, digital influencers, open-everything and a culture of sharing. © Christopher Koska is a data and algorithm ethicist (freelance research colleague at the Zentrum für Ethik der Medien und der digitalen Gesellschaft (Centre for Media Ethics and Digital Society), zem::dg), freelance digitisation consultant, business analyst and IT project leader at Striped Giraffe Innovation & Strategy GmbH, partner at dimension 2 economics & philosophy consult GmbH and Vice-Chair of pro philosophia e.V. His research focuses are at the intersection between data-driven value-creation models for companies and educational establishments, as well as ongoing efforts to increase and improve digital self-awareness in their workforces and client bases. © Torsten Larbig teaches German and Religion (Roman Catholicism) at a grammar school in Frankfurt, where he is also involved with promoting language. He is also a lecturer on the subject of “Digital Media and Teaching” at TU Darmstadt and has been actively involved in educational discussion networks on the internet since 2008. He founded #EDchatDE – the first German-language Twitter chat about education-related issues – together with André J. Spang. As a lifelong learner, Torsten Larbig continually addresses questions relating to “digital literacy”. © Caterina Magro works in language learning app Babbel’s Didactics Department, the team of over 150 language experts and teachers responsible for producing and optimizing digital learning content for 14 learning languages accessible via seven “display” languages. In the past eight years, Caterina has been involved in every aspect of digital language learning, from localisation and content production to project management and instructional design. In her current role as Senior Instructional Designer, she ensures that Babbel users achieve their goals with the most effective language learning software on the market. Before coming to Babbel, Caterina worked in Berlin’s Italian Cultural Institute and taught in the Language Center at Humboldt University, and created digital learning content for a variety of products and tools. © Harald Melcher is Managing Partner at m2more GmbH, Berlin. m2more has been developing and implementing strategies and concepts in the fields of education and the media since 2012 – for companies and organisations, and with a strong focus on digitisation. Furthermore he is Managing Director of m21 Bil­dungs­medien GmbH, which supplies innovative digi­tal products especially for schools with the brand name Lerneo – many of which feature Learning Analytics functions. Before that, Harald Melcher worked as Managing Director of AKAD-Hoch­schulen, the Ernst Klett publishing house, and he was also MD during the establishment/development phase at Cornelsen Soft­ware. He is a member of the Board at Didacta Verband der Bildungswirtschaft and is active in two Bitkom working committees. © Andrea Pfeil studied education to degree level, specialising in adult education, communication science and German as a foreign language, as well as a master’s in education management. Over the past 16 years she has focused on developing quality in educational processes and the development of hybrid language and training courses. She spent many years in teacher training in Germany and overseas, and worked on the design and development of blended learning and online courses, as well as digital training formats, at the Goethe-Institut. Andrea Pfeil was a multimedia and distance learning coordinator at the Goethe-Institut head office in Munich before she changed jobs in 2014 to work as language program director at Goethe-Institut New York. © Niels Pinkwart holds the Professorship in "Computer Science Education / Computer Science and Society" at the Humboldt University in Berlin. He is also principal investigator at the Weizenbaum Institute for the Networked Society and at the Einstein Center Digital Future. He has conducted numerous research projects on themes relating to technology-supported teaching and learning, and is distinguished by over 200 publications in this field. One of his roles is as speaker for the working group on Learning Analytics, part of the eLearning steering committee at the Computer Science Association. © Sarah Rogerson leads the Assessment Development team at Cambridge Assessment: English. She is a passionate advocate of using new technologies for widening access to learning and assessment and has pioneered the use of immersive technologies for reducing language test anxiety. Her thoughts on the potential of immersive technologies in language learning can be seen in the chapter: Imagining the potential for using Virtual Reality technologies in Language Learning. Currently studying for an MSC in digital education, she works across a suite of innovative products aimed at reimagining how we assess language. © Bernd Rüschoff holds the chair in didactics and applied linguistics in the Institute for Anglophone Studies at the University of Duisburg-Essen. He has a special research focus technology enhanced learning systems, and has since the 1980-s participated in a number of national and international projects dealing with the development and assessment of digital tools and multi-media resources in language learning. In addition, his research addresses issues a wide range of issues in the field of applied linguistics, such as language & culture, bilingual education, corpus linguistics and data-driven learning, as well as the implementation of CEFR and competency-oriented principles in language learning. © Mel Slater is Director of the Experimental Virtual Environments for Neuroscience and Technology (EVENT) Lab at the University of Barcelona. The EVENT Lab carries out research both on technical advances in VR, and its applications in psychology and cognitive neuroscience. A specialisation in recent years has been to study the influence of the virtual body on behaviour and cognition. Mel Slater recently started his second European Research Council grant. He is co-founder of the spin-off company Virtual Bodyworks S.L. © Svetlana Titova Vice Dean, Professor at School of Foreign Languages and Area Studies, Lomonosov Moscow State University, has over 25-year experience in EFL teaching, training and publishing in foreign language education and e-learning. She is a material developer and a tutor of online professional development courses on IT and mobile competence of FL teachers. Her research areas are ICT integration into EFL classroom, mobile learning, professional development of foreign language teachers. She is an author and a coordinator of the educational website Learning and Teaching with the Web aims at facilitating the process of implementing digital and mobile technologies into learning experience. © Olaf Zawacki-Richter wrote his doctoral thesis in 2003 on “Gelingensbedingungen zur Entwicklung von Online-Studiengängen” (success factors for the development of online study courses). He has been Professor of knowledge transfer and learning with new technologies at the University of Oldenburg, where he is Director of the Center for Open Education Research (COER). Professor Zawacki-Richter is the author of over 120 publications, as well as co-publisher of magazines including Distance Education and International Review of Research in Open and Distributed Learning. Invitations to keynote speeches and lectures at international conferences have taken him to countries including Australia, Brazil, Canada, China, Columbia, Saudi Arabia and South Africa. ©Timm Lutter Timm Lutter (32) is Public Affairs Manager at Cornelsen. His responsibilities include representation of education policy interests, as well as public relations with parties, ministries, associations and foundations. Before that he was head of department at the Bundesverband Informationswirtschaft, Telekommunikation und neue Medien e. V. (Bitkom) – the German Association for Information Technology, Telecommunications and New Media – where he was most recently responsible for the focus areas of consumer technology and digital media. Lutter studied history, philosophy and politics in Germany and England. During his degree he was a student assistant at the Max Planck Institute for Human Development. He is a member of the Board of Directors at the Bündnis für Bildung (BfB) – German Education Alliance – a charitable organisation with the objective of supporting the digital transformation in teaching and learning.